Nature vs Nurture – Is a poet born or made? For Sri Chinmoy Races.org, I have written an article on some personal experiences of self-transcendence. An article which bought back memories of winning Menston village fun run (under 7 category) and also coming last in a school cross country race (aged 15). In this article on sporting immortality, I failed to mention that I was also awarded “Menston Cricket Club under 13 fielder of the year”, but you don’t want to boast too much about these sporting achievements. (I think I was the only one to catch someone out in that particular season). Early efforts at self-transcendence hampered by feet not reaching the pedals. When I was young, I didn’t feel I was a gifted athlete. In fact, as mentioned, I came last in a cross country running race. After coming last, I “retired” and decided my genetics for sporting events must be very poor. To be fair, my parents were not exactly sub three hour marathon runners. 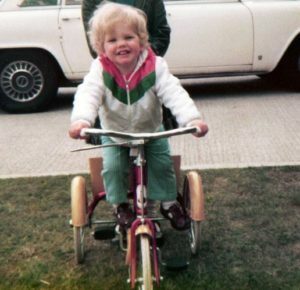 But, 20 years later, and after winning the National Hill Climb Championship, many might have assumed I had very lucky sporting genetics. But, I’m not sure, what to make of the role of genetics. I do feel that meditation and a spirituality can have a positive impact on sporting performance. I cannot quantify the impact, but it does make some kind of difference. I certainly believe there is more to potential achievement than the pre-determination of genetic ability. Whether you meditate or not, even great personal faith and inner belief can have a positive impact. Is a poet born or made? There is an old saying that “a poet is born not made”. But, Sri Aurobindo disagreed with this statement, saying if you practise yoga you can develop artistic capacities in any field. Many of his own devotees took up poetry and became quite accomplished. This is an extract from one of Sri Aurobindo’s wonderful letters to a sadhak. Sri Chinmoy would also agree with the idea that through prayer and meditation, you can develop hitherto unknown capacities. 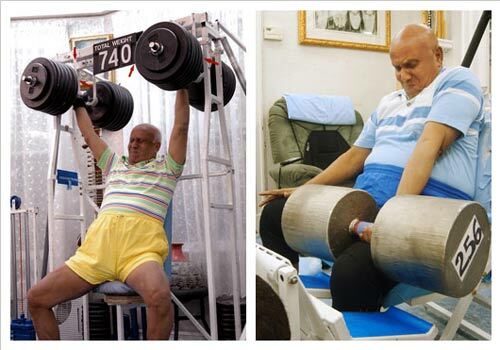 Sri Chinmoy weightlifting. After big weightlifting celebrations, Sri Chinmoy would sometimes give a music concert on several instruments. Great spiritual Masters like Sri Aurobindo and Sri Chinmoy have a powerful capacity to meditate very deeply; it gives a unique concentration and inner capacity. In our cases, our efforts at meditation may seem very feeble – 30 minutes without thinking what to have for lunch can feel like an achievement. I don’t feel it is a powerful meditation before a race that makes a difference. But, approaching sport, and indeed any activity, with a spiritual perspective can help us to transcend the limited capacities of the mind and body. The only thing is 16 years of meditation and spiritual practise have, as of yet, failed to produce any poetry. I’ve learnt to appreciate poetry – especially psychic and spiritual poetry. Appreciation is an important first step; there is an aspiration to express some ideas in poetry, but it hasn’t yet percolated from the poetry world through the mind to the fingertips. Maybe meditation has helped my cycling, but modern life doesn’t seem conducive to learning the ancient art of poetry. I feel I would need more patience. Still everything is possible.